The teenagers at the CCC have been busy dismantling their night structure. 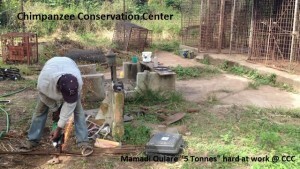 We called our usual welder, Mamadi Oulare, from Faranah for help! He’s been working for the last week reinforcing the structure.. until next time. Some chimpanzees (mostly the males) love to see him work: welding, cutting bars, using big machines that makes lots of noise… Mamadi is used to them and has some favorites. 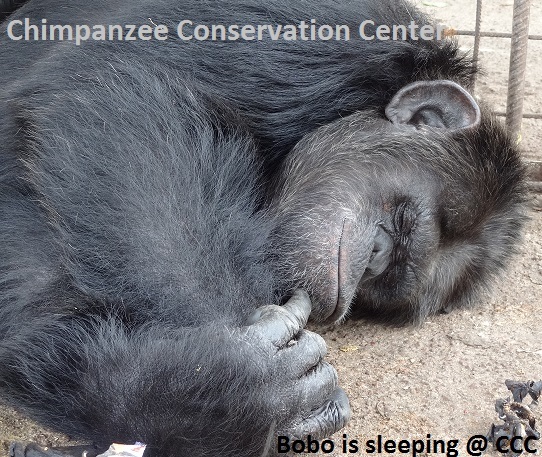 His most favorite chimpanzee is Bobo, but who would not love him, our big gentle giant? Here he is sleeping.